Packed with potent plant- and vitamin-derived antioxidants, this high performance duo visibly transforms the appearance of dry, dull skin while repairing environmental damage which can accelerate the ageing process. The hydrating Resist Anti-Ageing Antioxidant serum and C15 Super Booster work together to brighten uneven skin tone, fade brown spots and soften dry skin, for a smooth, radiant, younger-looking complexion. 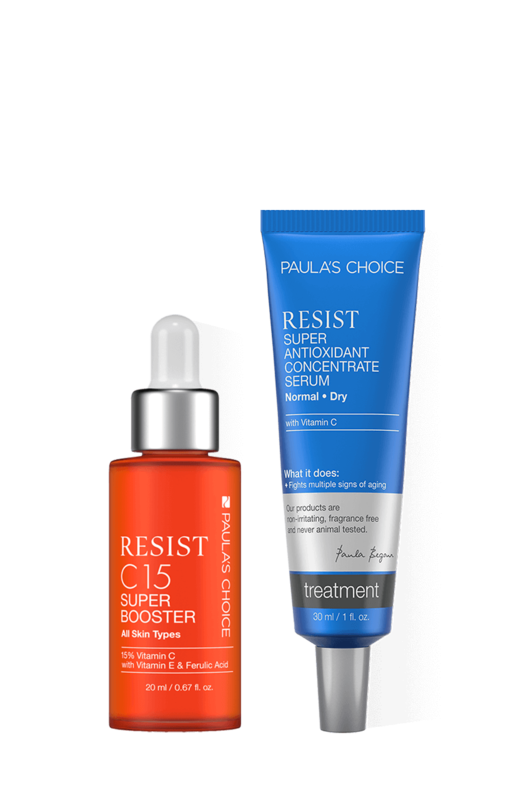 C15 Super Booster can be used alone or mixed with Resist Super Antioxidant Concentrate Serum, in the morning and/or in the evening, depending on your skin's need. Apply after cleansing, toning and exfoliating. During the day, always follow with a moisturiser containing a broad-spectrum sunscreen rated SPF 30 or greater. If applying at night, follow with a night cream. How is Resist Super Antioxidant Concentrate Serum anti-ageing? 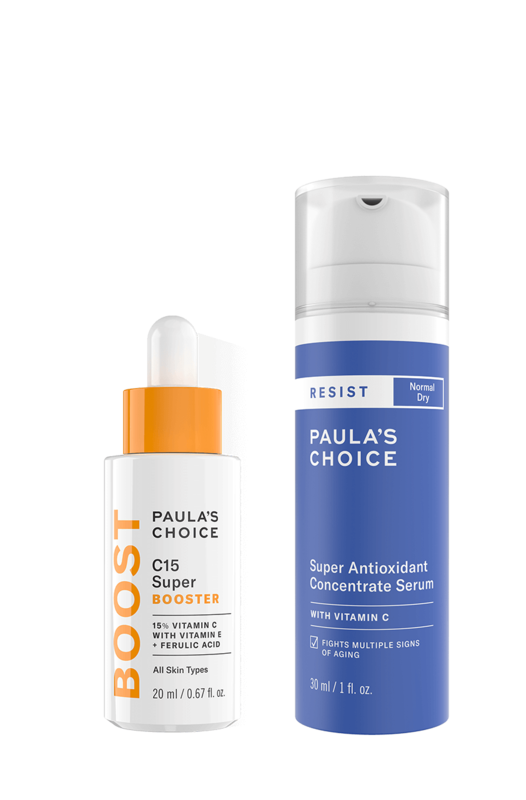 Resist Super Antioxidant Concentrate Serum is one of the two Paula's Choice serums that does not contain retinol, making it ideal if you cannot tolerate retinol (or are pregnant). While retinol is a fantastic ingredient, it is not the only one that combats ageing. Resist Super Antioxidant Concentrate Serum contains powerful plant- and vitamin-derived antioxidants that help to minimise damage from environmental attack (which can cause skin to look older) as well as vitamin C which restores visible radiance to dull, dry and uneven skin.